12 Most Dangerous Sea Creatures Divers Need To Know - We Love Sharks! 12 Most Dangerous Sea Creatures Divers Need To Know - We Love Sharks! These are the top 12 most dangerous sea creatures in Earth’s waters, but note that most of them will not bother you if you stay away from them. While many divers fear shark species like the great white, the tiger shark, and the bull shark, the chances of a shark attack are still very rare. But the odds of serious injury, and worse, are often overlooked with some other lesser known marine animals. Divers need to know that some of the smallest, and even attractive, creatures in the oceans and seas can harm them. Take number 12 on our list for instance; the feisty Titan triggerfish. This seemingly harmless and little-known reef species packs a mean bite, and is more often the reason divers and snorkelers surface with bruises and bites. While some of the animals on this list could kill you outright, others will leave you with very nasty bites. So without further delay, below is our rundown of the 12 most dangerous sea creatures you’ll need to watch out for when next you go diving. Though that depends on where you are diving, of course. 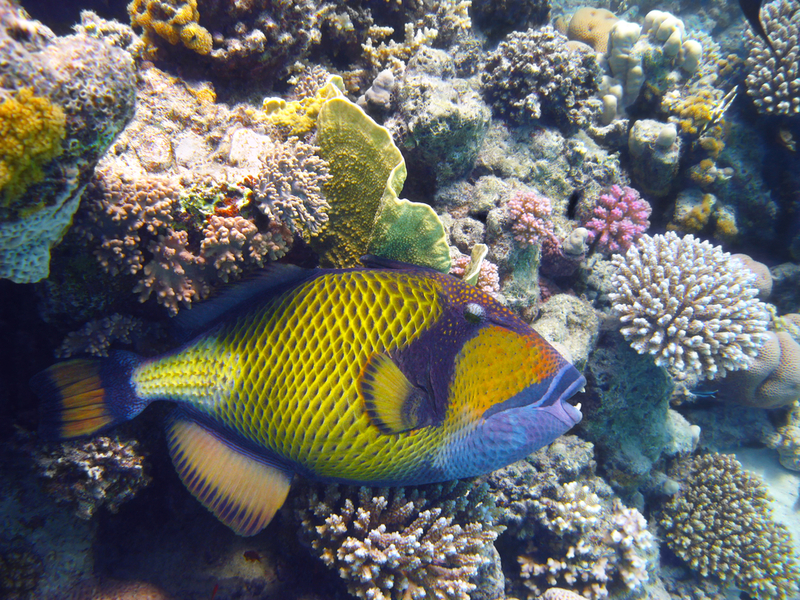 A Titan Triggerfish in the Red Sea. Though generally small in size, the Titan variety of triggerfish are not to be toyed with. Many species of triggerfish are friendly, but this particular one defends its “territory” against intruders in a very feisty and highly aggressive manner. The Titan triggerfish grows up to one foot long and it has very sharp teeth in a powerful jaw structure. They have injured several divers severely. In fact, in its native habitat, local divers are more wary of this fish than any other species. Do not take this animal lightly if you spot it in the water! Habitat: Tropical and subtropical waters worldwide. Though experts consider the stingray to be a docile creature that only attacks in self defense, some widely publicized incidents involving this fish earns it a spot on our list. Many nature lovers would remember Steve Irwin the world-famous “Crocodile Hunter.” Well, he died on September 4, 2006, in what experts termed a freak accident with a stingray. 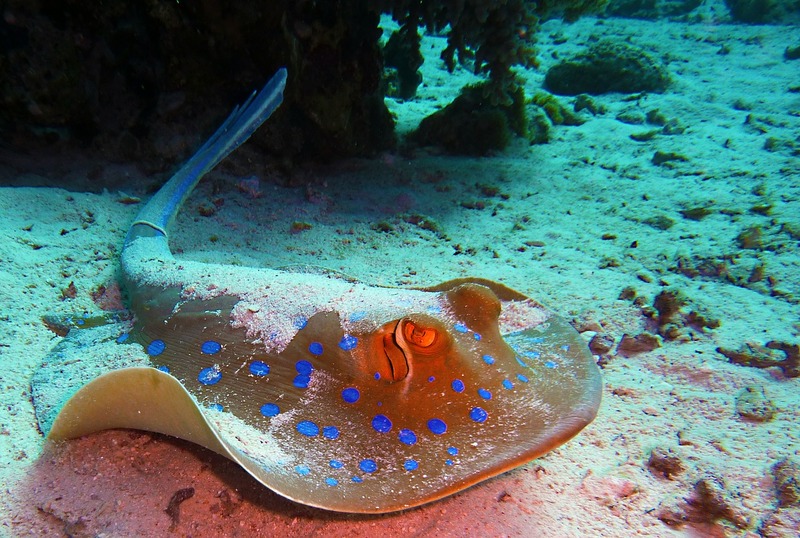 Most stingray-related wounds would occur on a person’s lower legs. That’s because these fish like to stay buried in the sand on the ocean floor so it’s not uncommon to accidentally step on one. However, in Steve Irwin’s case, the frightened fish flipped up its dangerous and venomous barbed tail and stabbed him right in the heart through his chest. The stingray in question was later identified as an Australian Bull ray with a sting that measured up to 8 inches long. Although the venom in itself is very painful, it’s not usually deadly. But a stab to the chest, abdominal area, or heart would kill most people anyway, venom or not. Just six weeks after Mr Irwin’s death, 81-year-old James Bertakis almost suffered the same fate when a stingray leaped out of the water into his fishing boat in Florida and stabbed him in the chest. Luckily in his own case, he didn’t attempt to remove the barbs from his chest and that likely saved his life. In the unlikely event of a stingray injury, seek medical attention quickly because the venom causes cell and tissue death. If untreated for long, the affected limb may have to be amputated. The tricky thing about stingrays is that they spend a lot of time partially buried on the ocean floor. Divers have to cautious not to step on one. Habitat: Indo West Pacific waters. Beautiful-looking creature but dangerous too. There is no better way to say it: the venom of this urchin is potent and deadly. In the human body, it causes spasms of the smooth muscles, convulsions, drowning, paralysis, shock, and death. 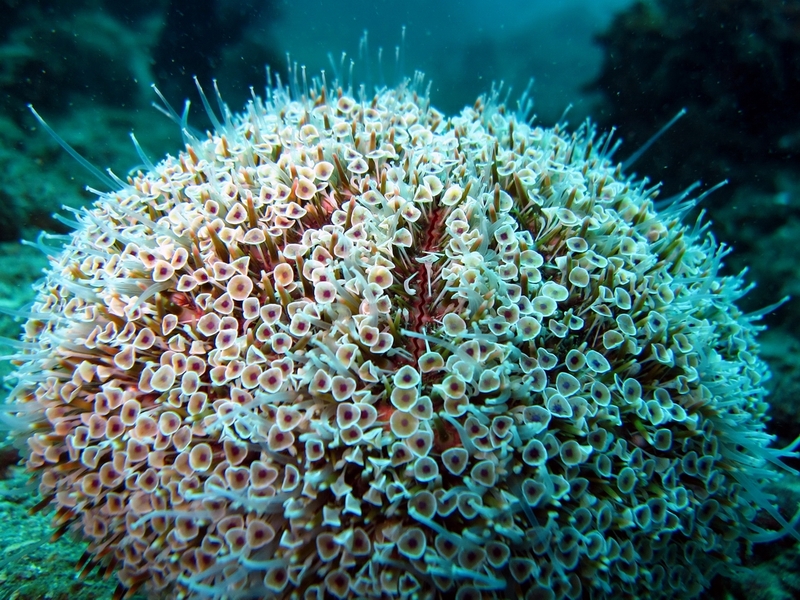 So watch out for those pretty “flower-like” structures on this urchin. Once it makes contact with your bare skin, it will pump the venom in. 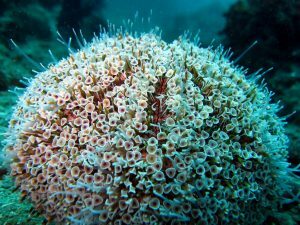 The flower urchin is infamous and responsible for a number of human deaths. Electric eels in an Aquarium. 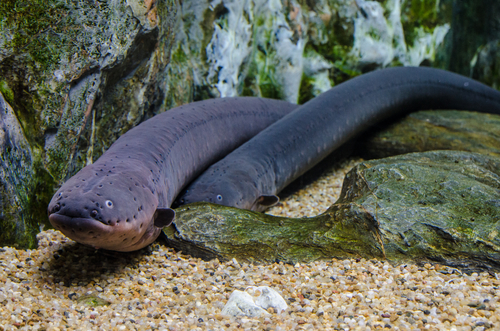 These eels are predatory and can deliver an enormous electric discharge of up to 600 volts maximum. They do this through the over 6000 electrolytes cells in their bodies. That much voltage can cause heart failure in a human being. Habitat: The Indo-Pacific region, Australia, the Indian Ocean (from east Africa to Hawaii), and French Polynesia. 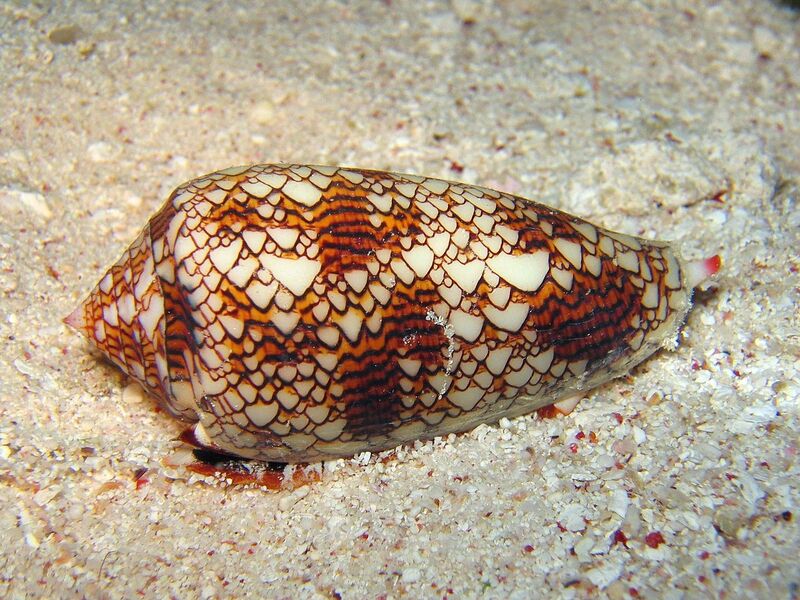 The textile cone snail is hands down one of the most dangerous sea creatures you could encounter! It’s commonly called the “cloth of gold” and measures just about 3.5 inches in length. Its attractive shell makes it a favorite for shell collectors but it’s believed that one drop of its venom can kill 20 people. This creature has tiny harpoons that are loaded with a deadly neurotoxin. It defends itself by shooting out these harpoons in every direction when it feels threatened. The barbs can pierce bare skin but those from larger more mature adults can even pierce a wetsuit. One species of cone snail is so deadly it’s called the “cigarette snail” in its locality. That’s because the victim would have time for just one cigarette before death. Habitat: Worldwide but especially tropical regions, deep oceans, coastal habitats along continental shelves, and close to coral reefs. 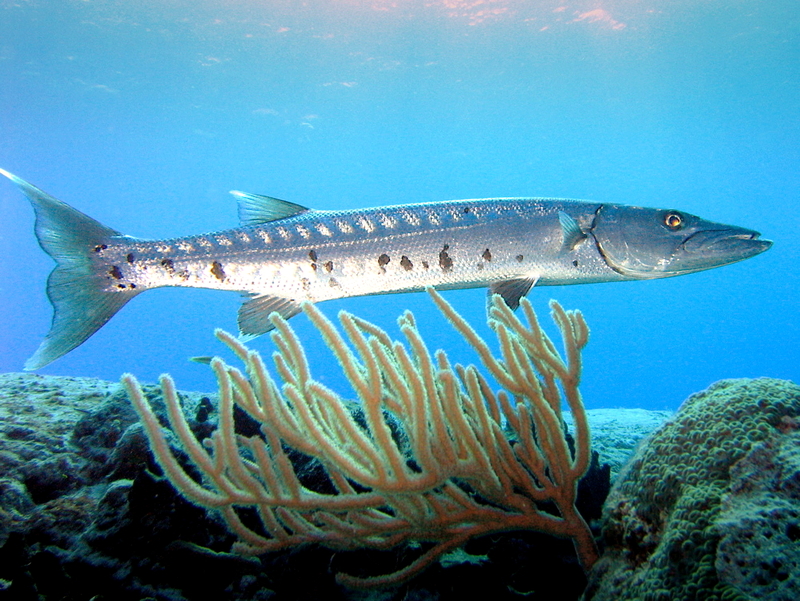 There are many species of this fish but the Great Barracuda (Sphyraena Barracuda) is the one of interest to us here. This fish is fast, aggressive, torpedo-shaped, and can grow up to 1.8 meters (6 feet) in length. Let’s also not forget its array of extremely sharp, scary teeth. Even a dead barracuda is dangerous as its flesh could contain the ciguatera toxin. This species is known to attack humans but especially people diving while wearing shiny objects. Their bite causes serious damage and blood loss. Furthermore, there are several instances of this fish leaping out of water to attack people in boats. Habitat: Tide pools and coral reefs in the Pacific Ocean and Indian Ocean, especially from Japan to Australia. Yes, the blue-ringed octopus is small (5 to 8 inches long) but it carries enough venom to kill 26 adults in minutes. The real danger with this creature is that their bites are typically painless, so victims don’t realize they have been bitten. It’s only when they begin to display symptoms like respiratory depression and paralysis that they’ll know something is wrong. Note that there is no antivenom for this octopus, so it’s definitely one of the most dangerous sea creatures in Earth’s waters. Other symptoms of its bite include nausea, heart failure, paralysis, blindness; victims can die in minutes. Fortunately, this creature is not aggressive and will usually flee from humans. Also, the rings on its body start to change color once the animal feels threatened so that serves as a warning to back off. 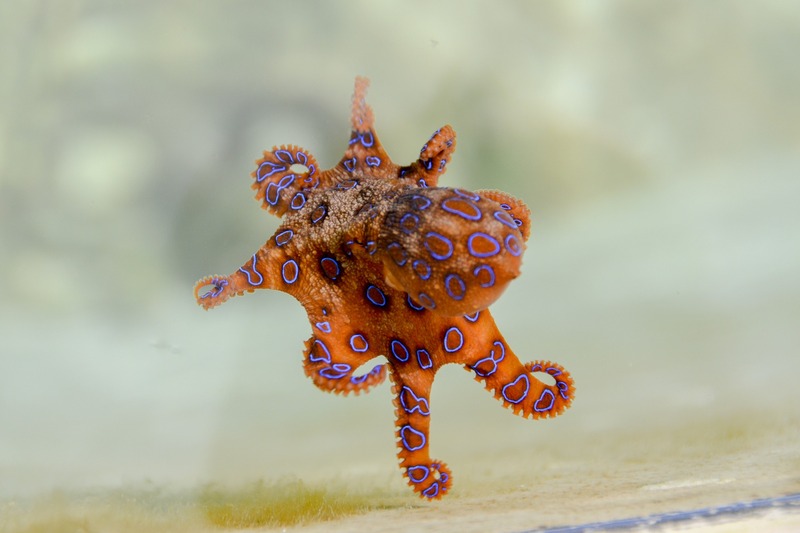 NEVER attempt to touch a Blue-ringed octopus if you see one. Habitat: Indo-Pacific waters and more recently the Atlantic region. Lionfish are venomous with very showy pectoral fins and poisonous spines. 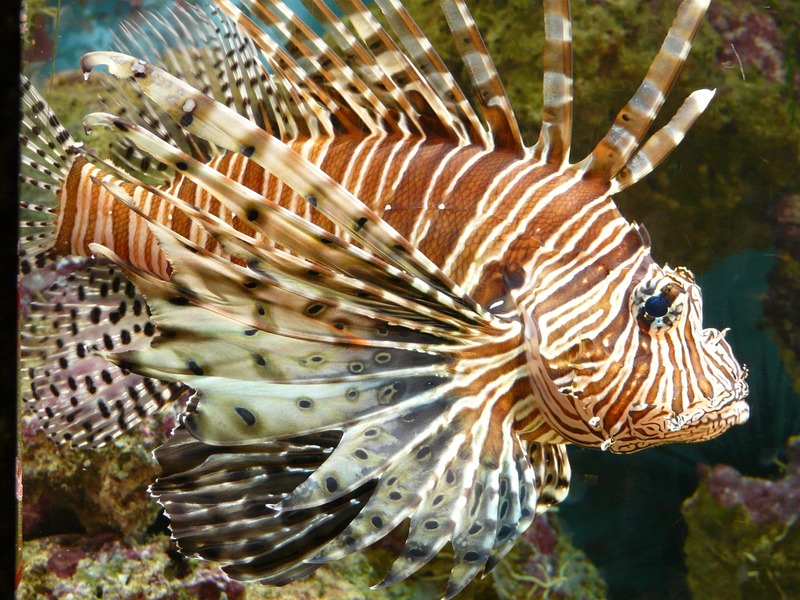 Their poison is so notorious that very few predators will dare take on a lion fish. To humans, the sting is extremely painful and causes nausea followed by breathing difficulties. One of the world’s most dangerous snakes is the Dubois sea snake, or reef shallows snake. But not only is it confirmed dangerous, it is the most venomous sea snake tested. They are most active at dawn and dusk but are not overly aggressive per se. The Dubois Sea Snake ranks among the top three most venomous snakes existing today. 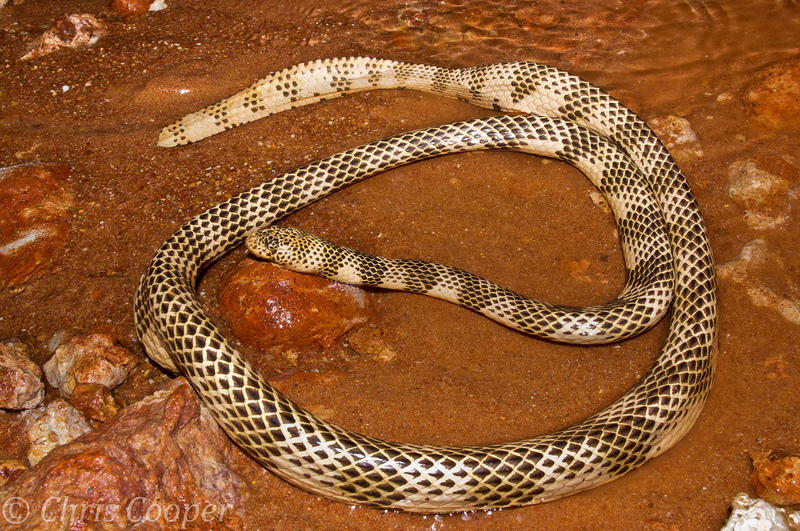 The other two are the Inland Taipan and the Eastern Brown Snake. Habitat: Shallow tropical waters and coral reefs in the Pacific and Indian Oceans. It ranges from the Red Sea to the Great Barrier Reef. 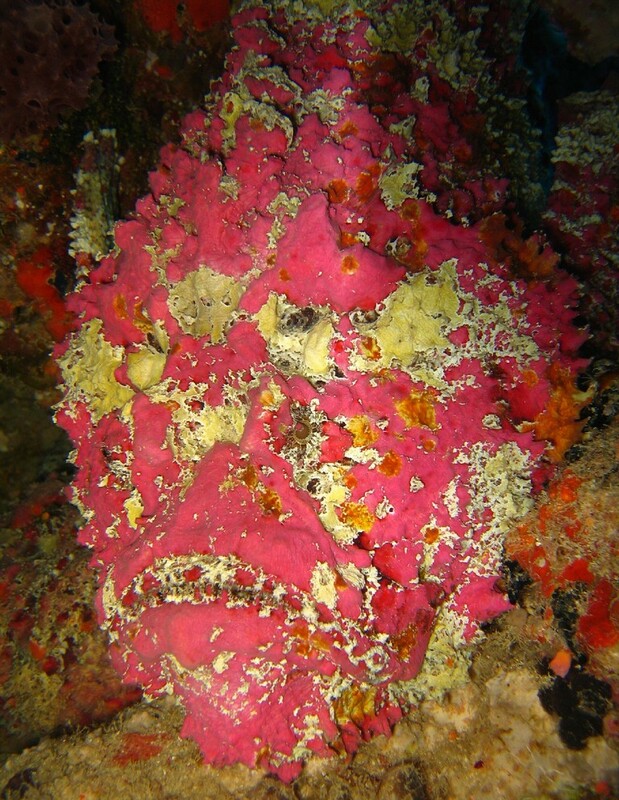 Meet the most venomous fish on Earth; the Reef Stonefish. It has 13 needle-sharp and poisonous spines arranged along its back. It can blend into the surrounding terrain perfectly till someone steps on it. The stonefish poison is still toxic on land for up to 24 hours. So, even out of water, it still poses a serous danger. Its venom is dangerous and extremely painful. Divers that have experienced it describe the pain as – indescribable. There are stories of victims begging for the affected body limb from a stonefish sting to be cut-off. The after effects of a reef stonefish sting will spread through the human body and hit the kidneys especially. And even after recovery, the victim will feel pains for years after. Its sting causes respiratory paralysis and could progress to heart failure. The Stonefish antivenom is the second most commonly administered one in Australia. Pufferfish or Blowfish with its spikes extended. Habitat: The warm waters of the Indian, Pacific and Atlantic Oceans. Some species live in fresh/brackish water. The pufferfish is so poisonous that it’s rated the second most poisonous vertebrate on Earth. There are over 120 species of puffer fish in the world and unfortunately most are dangerous so it’s best to avoid them. In fact, “dangerous” would be an understatement for this creature. Their poison contains tetrodotoxin; a substance that’s 1200 times more deadly than cyanide. Tetrodotoxin occurs in the liver, kidneys, the eyes, spikes and ovaries of puffer fish. There is no antidote for puffer fish toxin and it will kill an adult human in minutes. 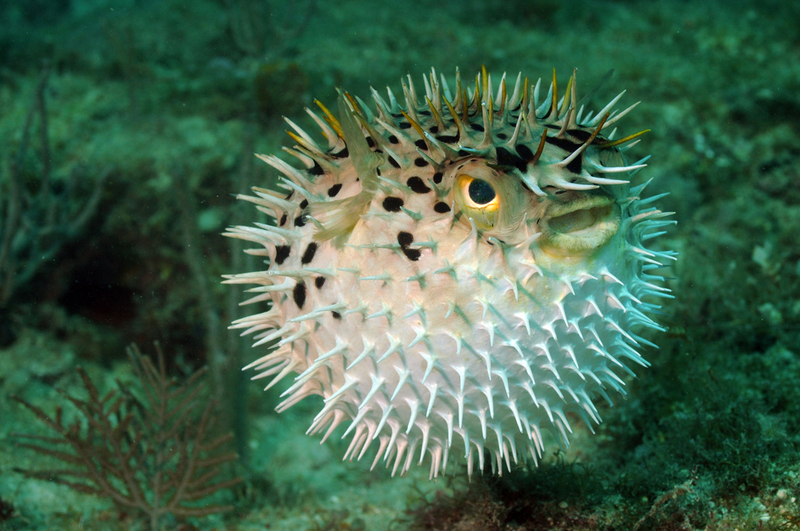 Pufferfish will expand their bodies to a round ball-like shape when they feel threatened. Surprisingly, puffer fish meat though extremely poisonous is considered a delicacy in parts of Japan, Korea and China. However, it is only served by specially trained chefs. Habitat: Widely spread across the Indo-Pacific Ocean. There are several species of jellyfish in Earth’s waters; some are harmful to humans while others aren’t. But there are three varieties that are notoriously dangerous and concern us here; the box jellyfish (Chironex Fleckeri), the irukandji (Carukia Barnesi), and the Malo Kingi. Stings from any of these animals are painful in the extreme and can be quickly fatal to humans. Even the less venomous species are usually fatal to children. They all have a box-like, squarish bell with long, slender, dangling tentacles. A fully grown one can have up to 15 tentacles on each corner. These jellyfish dangle their tentacles in the water after them with some tentacles growing as long as 10 feet. Each of these tentacles has approximately 500,000 harpoon-shaped microscopic mechanisms that inject venom into its victim. 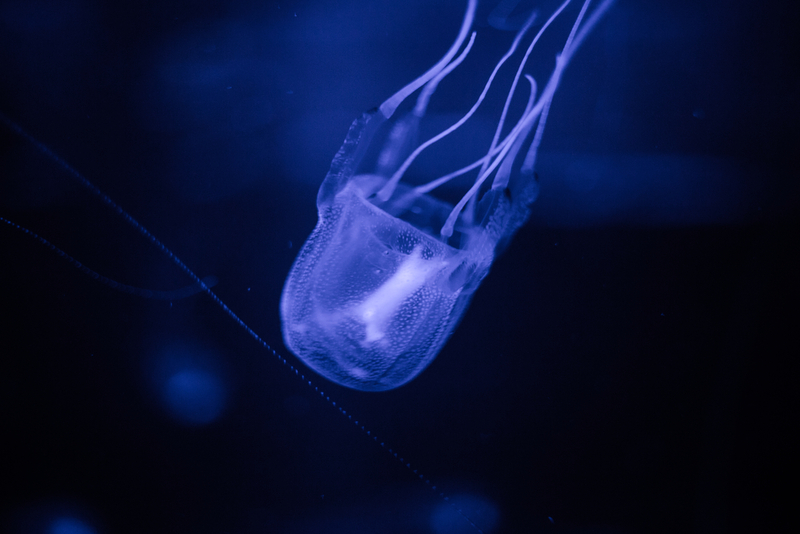 Unlike other jellyfish species, box jellyfish actively hunt prey and are quite swift in the water. The jellyfish will latch onto humans by wrapping its dangling tentacles around the limbs or other parts of the body. Contact with human skin is very painful and a diver unfortunate enough to receive up to two meters of tentacles can be dead in two minutes. Usually, victims will experience heart failure and die before they can get to shore. This creature is regarded as the most dangerous sea creature and indeed the most venomous living thing on Earth. At least 100 people die every year from box jellyfish encounters. Have you come across any of these creatures in the open ocean before? How did you handle the situation? Let us know in the comments.